Tabitha Babbitt was a quiet weaver living in a Shaker community in Massachusetts. The community thrived on the forestry industry, and she would observe men hard at work sawing logs. 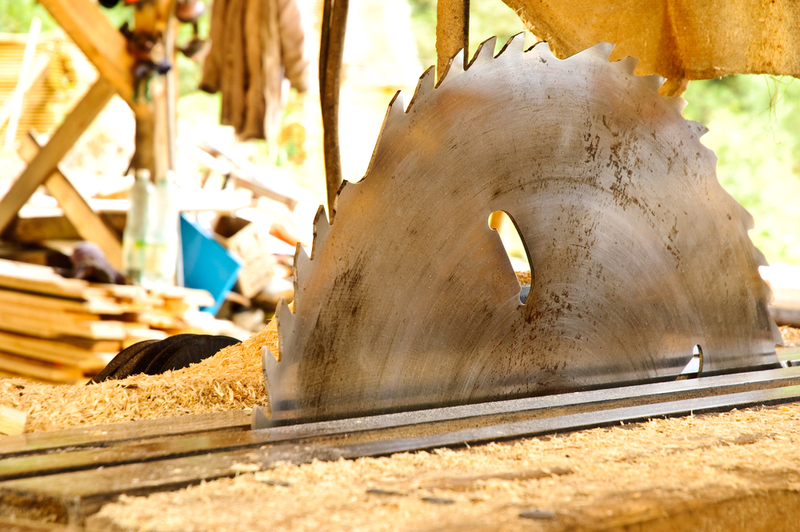 In 1810, she thought up an easier way of cutting wood that wouldn’t expend quite so much energy. The men were using a pit saw. It had two handles which two men would pull from side to side. However, the saw only cut the wood when it was being pulled forward, meaning the second or reverse pull was fairly useless other than to get the saw back to the starting position. She considered this a waste of energy and thought about how to improve the efficiency of the saw. Eventually, she came up with a prototype, attaching a circular blade to her spinning wheel. Using the pedal of her wheel to power it. As the blade spun, no movement was wasted. Wood could be cut faster with half the manpower needed for the pit saw. A larger version of her design was later installed in the saw mill. It’s one of history’s great ironies. Then and now, construction has been a field dominated by men. 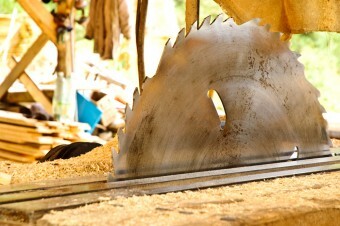 Saws of all kinds, and particularly the circular saw, are used daily to cut wood on construction sites. It might seem strange that a woman had the idea first, never mind had the wherewithal and means to design and build it; but to the Shaker community, it wasn’t strange at all. As you can probably tell by the leadership, the Shakers believed in equality for women. Women were given positions of power within the society, obviously quite unusual for the age. When the society moved to the Americas, they wanted the leadership to become more equal. To do this, they had to create leadership positions for men—not exactly the usual way of accomplishing equality. That said, men and women lived largely separate lives as Shakers. They were encouraged to be celibate, used separate staircases, and had separate household duties. However, they were brought together sometimes for tasks like apple picking or gathering firewood. The Shakers valued hard work, and doubtless appreciated the input of anyone—man or woman—who could make work go a little bit faster. So was Babbitt the first to invent a circular saw? As with so many inventions, numerous people seem to have independently invented similar devices around the same period in various parts of the world. For instance, in England Samuel Miller obtained a patent for a saw windmill, which supposedly used a form of a circular saw in 1777, though the type of saw is mentioned in passing, making it seem as though it was not Miller’s invention. A few years later in the same area of England, descriptions of Walter Taylor’s equipment seem to indicated that he had types of circular saws at his saw mill, but he only ever received patents for improvements to blockmaking. All that said, it appears that Babbitt’s circular saw design was much larger than the other circular saw mechanisms, and enough modifications were made to differentiate her invention from the rest. Her basic design was also the one that soon was copied at various American saw mills, popularizing the use of the circular saw in mills. However, due to her beliefs as a Shaker, she did not patent her design, instead sharing it freely. Babbitt didn’t leave off inventing after her circular saw. She’s also credited with improving the spinning wheel head, inventing a process to manufacture false teeth, and inventing a process for manufacturing the then semi-revolutionary type of nail known as “cut nails,” which replaced forged nails, a claim to fame that she shares with a few other inventors including famed inventor Eli Whitney. Because of their belief in celibacy, Shakers were required to gain new members through conversion. They attracted around 20,000 converts over 100 years. They also adopted children or indentured them, and had an extremely reputable schooling system. The group reached its peak in 1840 with around 5000 members, but then went on the decline. At the age of 21, Shakers were given the option to remain with the group or forge a new life path. Only about 25% of young adults chose to stay with the Shaker religion. As of 2012, there were only three Shakers left, all residing in Sabbathday Lake, Maine. They are still accepting new recruits, but it has been illegal for the group to adopt orphans since a 1960 law denied the right to religious groups. Shakers were among the first groups to refer to God as Father or Mother, a radical idea in the 19th century; it created tension among other groups who believed they were being sacrilegious. Among other Shaker inventions, the followers of this religion were some of the first to distribute seeds in paper packets, much like you’d find in the gardening section of your local store today. They were all about productivity and efficiency, resulting in other inventions like clothespins, the wheel-driven washing machine, metal pens, and innovations in waterworks. Despite the religion dying out in recent years, it hasn’t escaped popular culture. The American rock band R.E.M. recorded a song in 1987 called “Fireplace” whose lyrics are taken from a speech by Ann Lee.